Another little E3 gem trailer that wasn't part of any of the stage shows, but has managed to catch our attention, is Maximum Games' Extinction. If you were to imagine Attack on Titan, replacing the titans with orcs, you'd basically be on track for what Extinction offers, and it actually looks like it'll be a lot of fun. At the end of the game's cinematic trailer (which is, as you'd expect, not gameplay), there is a short snippet of gameplay, encouraging you to subscribe to watch the E3 footage as it emerges. that clip gives you the vague impression that the game mixes some Dynasty Warriors-like combat with small enemies with some Attack on Titan-like acrobatic combat with the lumbering orc monstrocities. What the cinematic trailer does a good job of is selling the idea of the game, though. As silly as giant orcs sound, there's an intriguing look to the game's design and flashy combat that's just simply appealing. From time immemorial, the world has been at war. For generations, humans have fought one another for land and riches while our true enemies have lurked in the distance. You are one of the world’s last defenders, a warrior named Avil equipped with the skill, speed and strength to oppose the endless wave of Ravenii and prevent a fate worse than death: Extinction. 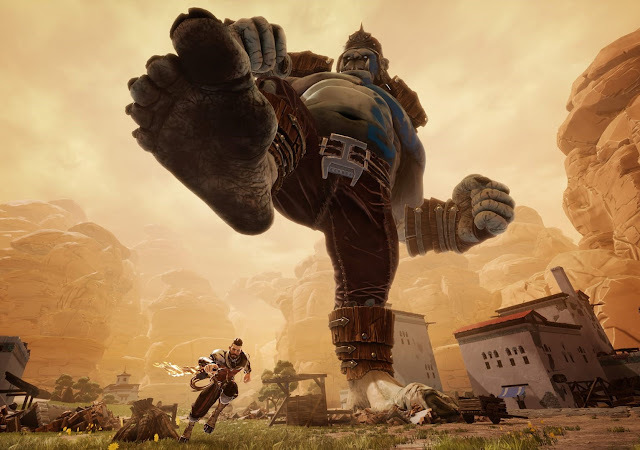 The game is being developed by Iron Galaxy Studios, a studio that specialises in porting games to "lesser" platforms; for example, the team was responsible for Destiny on PlayStation 3, Enslaved: Journey to the West on Windows PC, and the Killer Instinct: Season 2 and 3 packages for Xbox One. As far as I can tell, this is one of the few games that the developer has had creative control over, so it's going to be interesting if it can take its technical understanding of game development, and craft something with narrative and thematic meaning in it. Either way, it's a game that now we're going to be paying much closer attention to. The game releases in early 2018.